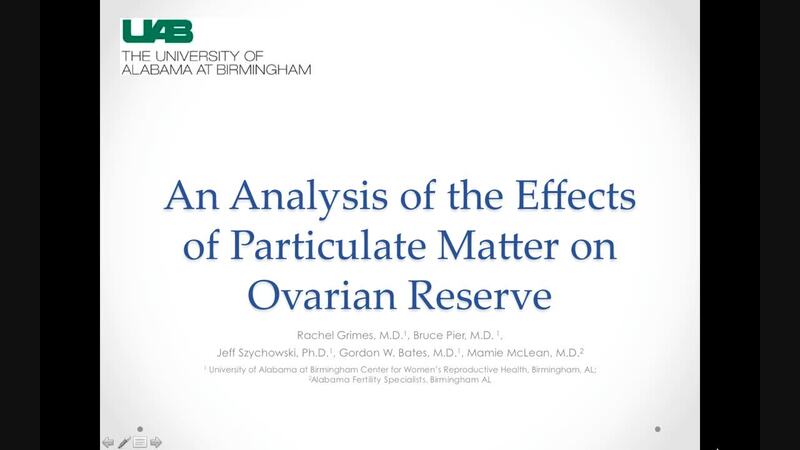 AN ANALYSIS OF THE EFFECTS OF PARTICULATE MATTER ON OVARIAN RESERVE. OBJECTIVE: Ambient air pollution, specifically particulate matter (PM) and ozone (O3), have been associated with serious health problems. PM is a mixture of solid particles and liquid droplets and O3 is a secondary pollutant generated from precursors of NO2 and volatile organic compounds in the presence of sunlight. Declining air quality is associated with decreased fecundability and adverse reproductive outcomes including lower live birth rates, preterm birth, and decreased chance of conception in the IVF population. The mechanisms driving these adverse reproductive outcomes are unknown, but may be due to changes in oocyte quality. The impact of air quality on ovarian reserve has not been studied. DESIGN: Our study is a retrospective cohort study in women from an academic reproductive endocrinology and infertility clinic with ovarian reserve testing. MATERIALS AND METHODS: The primary outcome is diminished ovarian reserve, defined as FSH >10 or an FSH ≤ 10 and E2 > 80. Normal ovarian reserve (or non-DOR) is defined as FSH ≤ 10. Inclusion criteria: age 22 - 45 years, and a listed zip code. Exclusion criteria: history of cancer treatment, or prior ovarian surgery. There were 1156 women included in ouranalysis. Particulate matter exposure, specifically O3 and total PM levels, were assessed by zip code according to the EPA database in relation to different time points from the FSH result. Baseline characteristics were compared using t-test or chi-square and Fisher’s exact tests as appropriate. Multivariable logistic regression was utilized to evaluate the relationship between exposure to particulate matter and ovarian reserve while controlling for confounders. RESULTS: In our cohort, 601 were Non-DOR (52%) and 555 were DOR (48%). Women with DOR were older and have had prior pregnancy. There were no differences in race, BMI, or smoking history by DOR vs non-DOR. Women with DOR had lower O3 exposure within the week prior to FSH assessment compared to non-DOR (37.6 +/- 7.5 vs. 38.8 +/- 8.4, p =0.03). There were no differences by DOR vs non-DOR for PM exposure nor other time intervals of O3 exposure. In multivariable logistic regression models, the odds of non-DOR increase with increasing O3 exposure (OR 0.98, 95% CI 0.97-1.00). CONCLUSIONS: Our study found no evidence of DOR among women living in areas with higher exposure to O3 and total PM, contrary to our hypothesis. Potentially other types of particulate matter, not assessed in this study, are associated with DOR, or the association of particulate matter with adverse reproductive outcomes is not mediated by ovarian reserve. Further investigation is warranted. References: 1. Brook, R.D., et al., Particulate matter air pollution and cardiovascular disease: An update to the scientific statement from the American Heart Association. Circulation, 2010. 121(21): p. 2331-78. 2. Checa Vizcaino, M.A., M. Gonzalez-Comadran, and B. Jacquemin, Outdoor air pollution and human infertility: a systematic review. Fertil Steril, 2016. 106(4): p. 897-904 e1. 3. Giorgis-Allemand, L., et al., The Influence of Meteorological Factors and Atmospheric Pollutants on the Risk of Preterm Birth. Am J Epidemiol, 2017. 185(4): p. 247-258. 4. Ha, S., et al., Associations Between Residential Proximity to Power Plants and Adverse Birth Outcomes. Am J Epidemiol, 2015. 182(3): p. 215-24. 5. Huang, J.V., G.M. Leung, and C.M. Schooling, The Association of Air Pollution With Pubertal Development: Evidence From Hong Kong's "Children of 1997" Birth Cohort. Am J Epidemiol, 2017: p. 1-10. 6. Janssen, B.G., et al., Placental mitochondrial methylation and exposure to airborne particulate matter in the early life environment: An ENVIRONAGE birth cohort study. Epigenetics, 2015. 10(6): p. 536-44. 7. Legro, R.S., et al., Effect of air quality on assisted human reproduction. Hum Reprod, 2010. 25(5): p. 1317-24. 8. Li, X., et al., Association between ambient fine particulate matter and preterm birth or term low birth weight: An updated systematic review and meta-analysis. Environ Pollut, 2017. 9. Maghbooli, Z., et al., Epigenetic Alterations and Exposure to Air Pollutants: Protocol for a Birth Cohort Study to Evaluate the Association Between Adverse Birth Outcomes and Global DNA Methylation. JMIR Res Protoc, 2017. 6(2): p. e29. 10. Stieb, D.M., et al., Ambient air pollution, birth weight and preterm birth: a systematic review and meta-analysis. Environ Res, 2012. 117: p. 100-11. 11. Stieb, D.M., et al., A national study of the association between traffic-related air pollution and adverse pregnancy outcomes in Canada, 1999-2008. Environ Res, 2016. 148: p. 513-26. 12. Sun, X., et al., The association between fine particulate matter exposure during pregnancy and preterm birth: a meta-analysis. BMC Pregnancy Childbirth, 2015. 15: p. 300. 13. Tanwar, V., et al., In Utero Particulate Matter Exposure Produces Heart Failure, Electrical Remodeling, and Epigenetic Changes at Adulthood. J Am Heart Assoc, 2017. 6(4).